Discover and explore the top beaches near Parikia and close to Sunset View Hotel. Enjoy the variety of experiences and views, relax your body and soul as the summer breeze cools you down. Spend unforgettable moments on the beach with your family or your significant other. 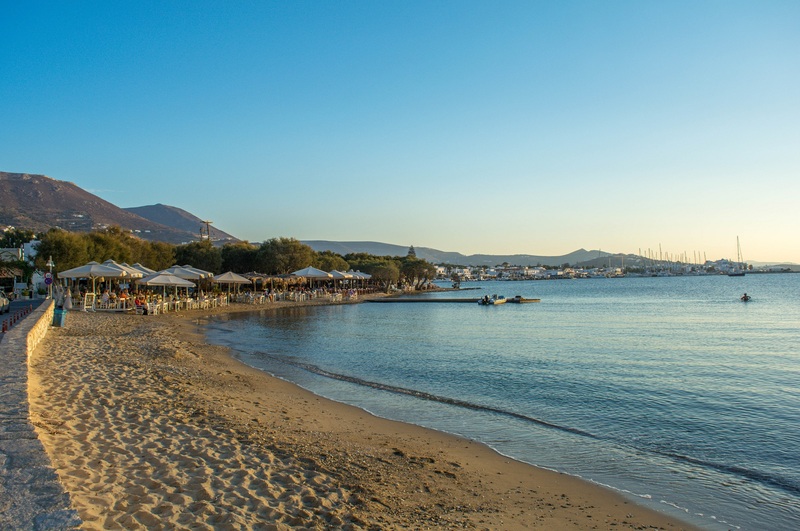 Livadia beach is the closest one, both to our hotel and to the capital of Paros. This is the main Parikia beach and it features all the necessary aspects that our visitors need. For your comfort, you will find sunbeds here, as well as umbrellas that will protect you from the sun. Food options are as many as you can imagine. Seafood taverns, bistros, Greek cuisine restaurants are almost touching the sand of south part of Livadia. You have many options for breakfast and lunch as well. If you are the kind of person who gets bored easily, this Parikia beach is suited for you. There are many options regarding water sports and other activities like beach volley. Marcello is a famous Parikia beach. 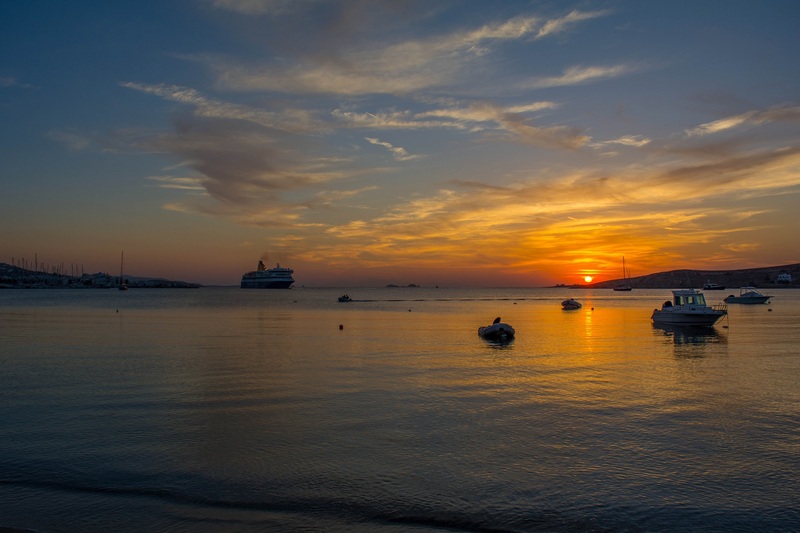 It is considered as one of the best in Paros. The location of Marcello is quite spectacular. It is situated across the bay and therefore, it feature Parikia for a view. When ferry arrives to the port, it’s time to take many photos as the sight is amazing. During the summer months, it attracts many visitors from all over the island. Due to its location it never has waves and therefore, it is safe for children. It consists of powdery sand and crystal sea. You have to consider the fact that you will not find available sunbed or umbrella in this famous Parikia beach. So you should arrive organized. If you have your own umbrella, take it with you. You should know that Marcello is the natural continuance of Krios beach. If you walk towards the west along the coast, you will find small sandy gems, just few meters long. This is an opportunity to relax on your “own and private” beach. You can reach Marcello with your own mean of transport, following the road that circles Parikia bay. 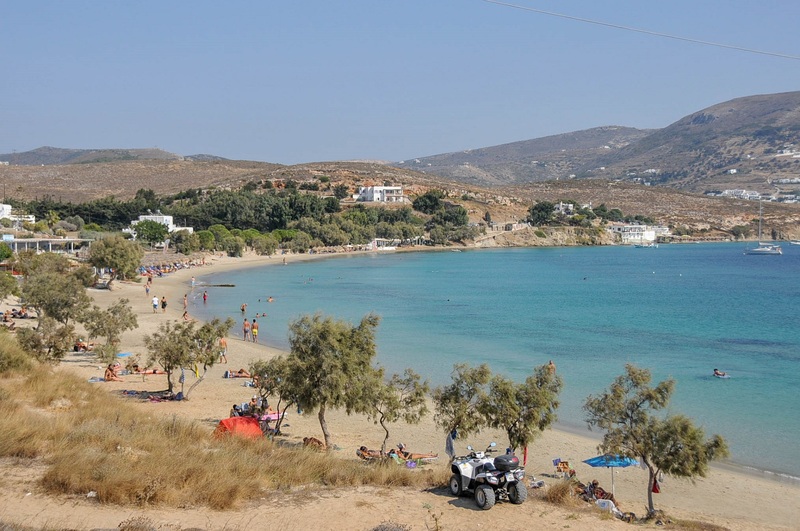 Krios is another well-known Parikia beach. It is situated on the opposite side of the bay and it is “attached” with Marcello. It offers almost the same experience as Marcello. The sand is powdery, there are almost no waves and the sea is crystal. Krios is well organized featuring umbrellas and sunbeds. There is also a beach bar, offering snacks, drinks and delicious dishes. As Krios is also one of the best beaches near Parikia, it gets crowded faster than Marcello. But, because the two beaches are close together, you will not have an issue of finding a comfortable spot. Because Krios has more western direction, you will not have the same view of Parikia. 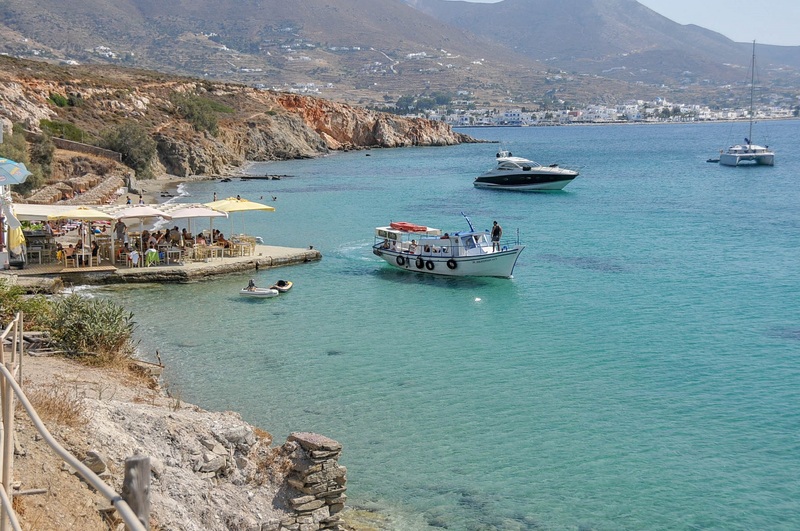 It is replaced by the view of the entrance to the bay and of the north part of Antiparos.